This article appeared in a recent issue of Sai Vichaar magazine and I am posting it here for devotees' reading pleasure. It goes without saying that Sai is everywhere, whether it is East or West. Read on. The presence of Shri Sainath in the lives of millions today stands as a testimony to His continued existence. Each prophecy and promise made by Baba while He remained in His mortal body has turned out to be true and His words can be found to be true to this day. Baba had clearly said "My bones will speak and discuss the welfare of those who will put their full faith in me even after my passing away". On another occasion He had commented about the village of Shirdi, "People will crawl to this place like ants in the future". Blessing Hemadpant to write a book on His life stories, Baba had said, "People who are naturally attracted to me will feel happiness and joy on hearing my name and stories". When a devotee was worried as to what will happen to him once Baba passes away, Baba clearly told him not to worry and that "He will be ever present with him and whenever the devotee called him with love, He will solve his difficulties". When another devotee thought that he had seen Baba in a dream ordering him to do something and went to confirm the same, Baba said, "No that was no dream, it was me telling you personally; I require no doors to enter any place". All the above incidents listed in Satcharita are happening even today. The only difference is that they are happening all over the world! There is another story in Satcharita of a Mrs Saptanekar being followed by a fakir offering help to carry the water pitchers and she later discovered that the fakir was none else than Baba when she saw His picture. A similar incident happened in Connecticut, USA this month where a stranger continuously visited an American lady. On every visit the stranger told her one incident from her life that only she was aware of. On the last visit she started to get eerie and started to do some research and stumbled on the picture of Shirdi Sai Baba on the Internet. Strangely enough the stranger who visited her a few times turns out to be none other than the great master himself and more curiously the stranger has not visited her since the time she stumbled on the picture! Here dictums of Baba, "Wherever my devotee may go in this whole wide world, I am aware of his or her life and will draw him or her to me, when it is time, like a sparrow tied with a thread to its leg". For one who follows Shri Sai with love and devotion, it is necessary to reemphasize their faith and evolve patience to overcome the curves that life pitches in from time to time. Losing courage and thinking that Shri Sai has deserted them will only bring unbearable agony and pain. Like a parent, Shri Sai can never desert his children. At the same time a mother will not refrain from giving a bitter pill to her child if it is needed! True to his words, Shri Sai works tirelessly for his ever-growing children and the children need to be conscious of the path laid by the master and make every attempt to walk on it. Baba himself has said that the path is not easy, so why cry when the going gets tough? Remember Baba with a pure heart and true to His words, He will carry you safely through life's tough situations. A lady in Kiew, Ukraine, had taken healing sessions with Pablo, the healer so dear to me, whom I've already mentioned once or twice. In her report on the session she wrote that in the course of it she saw a series of images of saints all aligned in one row. She knew every one of them except one. And when she went on to describe the one she didn't know it turned out to be an exact desription of OUR BELOVED SAI. And she said: "I may never know his name, but I know that this saint will always be with me and protect me wherever I am." This still brings tears to my eyes and once again I stand in awe before the greatness and immesurable love of our BABA SAI. HE ferries us across any and every waters, be they smooth or rough. May you feel HIS blessings, dear Sriram, in your exam and always and all of you brothers and sisters, too. 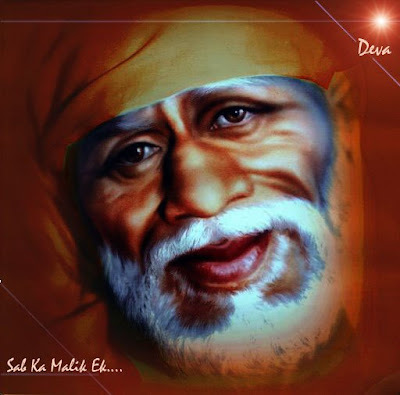 Sai does show Himself to us in various forms and often we will not be able to recognize Him. That's His special leela. That's why I make an effort to see Sai in EVERY living being, lest I may miss out on Him. OMSAIRAM!THANKYOU SRIRAM BHAI & ASTRID DEAR FOR SHARING SAI BABA's LEELAS WITH US. Our SAI is a all pervasive saint. He is omnipresent. All you need o do is think about him and he will be there for you. You may not see him or feel his presence but he is there. How he appered in the Photo of a wedding troup, how he appered for many people in many forms is some thing that is startling. His ways are uniques. All we need to do is pray him. Page created in 0.627 seconds with 51 queries.